Kinuthia, 28, is said to have killed the sixth year medical student in a bizarre fit of rage in Eldoret town, Uasin Gishu County. 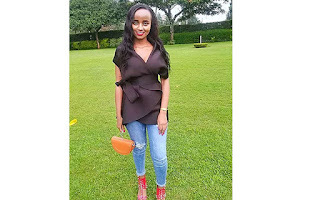 Sometimes last year, a heartbroken Naftali expressed frustrations to his mother Nancy Kinuthia, revealing how he was disappointed with Ivy, 25, for whom he had a childhood crush on since their days in primary school. According to Nancy, Naftali was surprised that Ivy had turned disrespectful. “My son told me that she (Ivy) constantly abused him,” said the mother, still reeling in shock at the turn of events. And like a caring mother, Nancy advised her firstborn son to end the relationship. “For a long time since July last year, I thought they had parted ways because I never heard him complain thereafter until when I was hit with this unbelievable news that he has committed murder,” says Nancy. Naftali, described as a recluse by work colleagues and relatives, is said to have been planning to marry Ivy in December. The slain medical student at Moi University was in the final stages of completing her studies and it is claimed that Naftali was known to her as ‘George’. Though Naftali’s mother says she thought her son had cut links with Ivy, a friend to Kinuthia claims he was determined to marry her and had even bought her a BMW as a gift last year. We could, however, not immediately establish whether indeed Naftali had gifted Ivy such a car. “I not aware that he had bought her a car, what I can say is that I thought they no longer talked to each other. When he was here during Christmas he never mentioned the girl like he used to before. I concluded he had lost interest in the girl only to realise they were still together,” states Nancy. Naftali who lives in Nairobi, works for one of the leading betting companies in the country. He occasionally visits his parents’ residents of Thika town where his father, George Kinuthia Njami works in a hardware shop belonging to a relative who is a major shareholder of Chania Travellers Sacco. It emerged that a shell shocked Naftali was struggling to accept he had committed murder when the father visited him in hospital. “He told his father that he can’t believe that it is him who killed the girl,” Nancy told The Nairobian, praying that the State will understand that Naftali is a polite and harmless son who graduated few years back from Jomo Kenyatta University of Agriculture and Technology (JKUAT). Nancy does not understand what exactly might have driven the son brought up on strong Christian values to commit murder. “I am just shocked and lost for words. I know him as a God fearing man and a regular church goer,” says the mother of four. Naftali and Ivy schooled together at Joyland Academy in Gatanga Murang’a before the girl was transferred to another primary school in Thika town. Both hail from Chomo village where the boy’s mother was an English teacher at a local secondary school. Neigbours of the slain student in Thika town and those in Gatanga are still coming to terms with callous murder. Naftali used an axe to hack the girlfriend to death, having driven in his car all the way from Nairobi to Eldoret where Ivy studied. “She was an upright student and it is a shock that she was killed by a person who has been a friend since childhood,” said a neighbour in Thika. Mary Nyaguthie, a resident of Gatanga, mourned, saying Ivy did not deserve to die at her prime age. “It is sad for the country to lose such a bright person at a tender age. There is need for the community to address mental health. Stress and depress is killing many people thus need for community leaders to talk to the youth and prevent repeat of such incidents,” she said. Ivy died a day to marking her 25th birth day, which she had planned to celebrate on the eve ning of April 10. The student had just completed taking her practical at Moi Teaching and Referral Hospital (MTRH) when the boyfriend- turn-killer pounced on Ivy as she walked out of the facility in company of colleagues. The assailant pulled the axe out of a sack, hit the deceased on the head before taking pulling out a knife and slitting her throat in one of the most horrifying incidents involving love affairs gone sour. A mob descended on Naftali as he attempted to flee from the scene. He is lucky to still be alive, thanks to the quick action of police who rescued him from a lynch mob baying for his blood.